US officials mocked Russian leaders Dmitry Medvedev and Vladimir Putin calling the dynamic duo Batman and Robin in official documents leaked yesterday by the Wikileaks and leftist news organizations. Let’s hope they have another one of those restart buttons lying around. 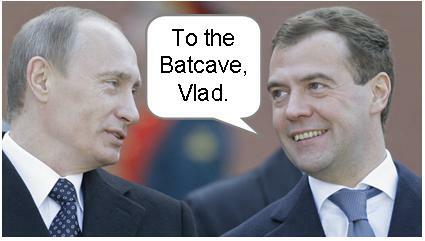 Russian President Dmitry Medvedev “plays Robin” to his strongman Prime Minister Vladimir Putin’s “Batman,” the U.S. embassy in Moscow said, according to documents leaked to international media on the whistleblowing Wikileaks website. The embassy documents also called Medvedev “pale and hesitant” in comparison to the “alpha-dog” Putin. However, despite Putin’s authoritarian image, there were also suggestions in the documents that the former KGB man was finding it tough to prevent his decisions getting bogged down in Russia’s notorious bureaucracy. The United States also leaned hard on France to refrain from sale of a French helicopter carrier to Russia, Wikileaks reported. According to a secret cable posted on the whistleblowing website, U.S. Secretary of Defense Robert Gates held a meeting with then French Foreign Minister Herve Morin in February in Paris, where they discussed the possible sale of a Mistral-class helicopter carrier to Russia. Medvedev’s office refused to comment on the insulting documents leaked to the press. The Kremlin “has not found anything interesting or something that deserves comments in the material posted by the WikiLeaks website,” Russian President Dmitry Medvedev’s spokesperson Natalia Timakova told journalists on Monday. “Fictional Hollywood characters hardly need to be commented on,” she said.